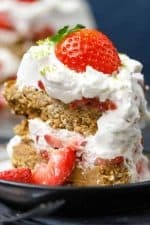 This Coconut Lime Paleo Strawberry Shortcake is a refreshing twist on the golden shortcake with luscious strawberries and mounds of fluffy whipped cream we all love. You’ll be amazed this is Paleo! This recipe is my version of a delicious dessert that can be enjoyed by all people (Paleo or not). It’s guilt-free, and what mom doesn’t love a guilt-free, healthy treat? This Paleo strawberry shortcake is made with fiber-rich coconut flour and naturally sweetened with maple syrup. The hint of lime and coconut flavor mixes perfectly with the fresh strawberries. My expert panel of taste testers – hubby and kids – and I agreed that coconut flour made the tastiest shortcake. It’s my favorite Paleo flour because it’s a great source of fiber, and I like the slightly hearty texture it creates. It also absorbs wet ingredients like a sponge, so for every half cup of coconut flour in a recipe, you’ll need to add somewhere around six eggs. To avoid “eggy” flavor when I bake with coconut flour, I use ground chia seeds or flaxseed to replace some of the eggs. I don’t find one better than the other – they both act just like eggs in the cake, cookie and muffin recipes I’ve tried them in. To make this Paleo strawberry shortcake with coconut flour I needed to add nine eggs. Replacing five of them with flaxseed keeps the “eggy” flavor under control. Replacing eggs this way is as simple as stirring a tablespoon of ground chia seeds or flaxseed with three tablespoons of water for every egg you want to replace, and letting it sit for a few minutes to thicken before adding it with the rest of your ingredients. If you’ve been avoiding using coconut flour because of all the eggs, this is worth a try. This Paleo strawberry shortcake recipe substitutes baking powder for a blend of baking soda and cream of tartar, and I’m happy to report it works great! I’m thrilled because my Paleo cakes and breads need all the lift they can get. It’s too bad non-Paleo additives like aluminum, cornstarch and gluten find their way into baking powder so often. It’s easy to make and use Paleo baking powder. It’s just two parts cream of tartar to one part baking soda, and whenever a recipe calls for baking powder, use it instead. I mixed up a small amount to store and added a pinch of arrowroot to keep it from settling. One tip though – don’t skip the mixing. My impulse to be lazy and add them separately resulted in a flat cake. Now I know there’s a chemical reaction taking place in the mixing, so it’s a minute or so well spent. If you like thick shortcake, an 8″ or 9″ square pan will be perfect. The 8″ pan made a denser cake since it was packed pretty full of batter and didn’t give the cake much room to rise. If you have a strong preference for lighter shortcake, choose a larger size baking pan. Layer cakes lack the ease and practicality of sheet cakes, but they’re still my favorite. This shortcake was a little slim in my 9″ cake pans, so if you have smaller pans they’ll be just right. My grandmother taught me to line the tops of cake pans with parchment paper. These coconut flour cakes are prone to sticking, so that little trick of hers is a huge help when it’s time to get the cake out. Figuring out a Paleo whipped cream for the strawberry shortcake was easy. People have been making whipped cream from coconut milk and cream for ages, and there’s lots of great information online about the process. The resulting whipped cream is so much like dairy whipped cream, I don’t think I could tell them apart. My kids weren’t crazy about it at first, expecting something more like Cool Whip, but some extra sweetener was all it took to win them over. It took me lots of tries to get the whipped cream right, and I did a load of research to figure out what was going wrong. 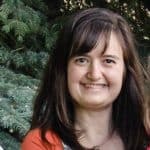 From what I’ve read I would say everyone’s experience with coconut whipped cream is different, but it does seem like a lot of people get a lot of different results. My version is slightly different from many popular coconut whipped cream recipes you might have seen or tried. Mine calls for chilled coconut cream instead of chilled and separated coconut milk. However, you could use a coconut milk that has been chilled and then skim the cream off the top. Just don’t use a brand that has guar gum in it. My favorite brand of canned coconut milk is Natural Value. The biggest tip I can give you about making Paleo whipped cream is to not use cans of coconut cream that have guar gum in them because then it will never separate cause the guar gum keeps it from separating. Let’s Do Organic Heavy Coconut Cream, Cha’s Organics and Aroy-D are my favorite brands of coconut cream. The Aroy-D comes in a larger carton, so measure out just over one and a half cups to equal a can. I also mention using a food processor and stick blender, which both did a better job making whipped cream than my electric mixer. Beating by hand isn’t bad either, especially to re-fluff it when it gets a frozen crust from sitting in the fridge or to finish off a batch done in the food processor. Lime is one of my favorite flavors and combined with coconut and strawberry it’s like a fresh summer breeze in a bowl. I especially love lime zest, but the juice is a bit overpowering for me. I thought the taste testers would all agree, but my husband surprised me by preferring a version with two tablespoons of juice and a bonus dash of zest. Everyone’s taste is different, so I encourage you to use the lime as you like to enhance the strawberries. Coconut flour is a unique flour to work with and doesn’t substitute well with other flours, so I don’t recommend any substitutions. Coconut flour can be found at Costco (I love Costco), or the natural foods store. My local grocer also carries it in their natural food section. You can also buy coconut flour on Amazon by following this link: Coconut Flour. You may also learn lots more about coconut flour and it’s pros and cons, along with an index of my recipes with it in it here. There’s some cooking going on here, but it’s actually lots of fun! I think the key is to allow plenty of time, and one of the great things about this Paleo strawberry shortcake recipe is time is on your side. Once the cake’s out of the oven, you control the pace, and everything can sit in the fridge until you’re ready. And don’t forget, the cook gets the biggest helping! 9 of the Best Paleo Carrot Cakes – My Favorite Cake! 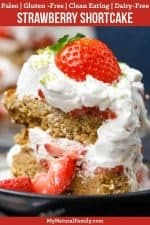 This Coconut-Paleo Lime Strawberry Shortcake is a refreshing twist on the golden shortcake with luscious strawberries and mounds of fluffy whipped cream we all love. You’ll be amazed this is Paleo! Stir the flax meal or chia seeds and water together and set aside to thicken. Place a rack center-oven and heat it to 350. Grease and flour an 8- or 9-inch square pan or two 7- or 8-inch round pans. If you’re using round pans line the bottoms with parchment paper, then grease and flour the paper. Thoroughly whisk the dry ingredients together. Beat the eggs until frothy. Beat the rest of the wet ingredients into the eggs one at a time. Gradually stir the dry ingredients into the wet. Add a little more almond milk if the batter is too thick to pour. Fill the pan(s) and bake for about an hour and 20 minutes for a square pan, or 35 – 40 minutes for round pans. Loosely cover with foil about halfway though. Remove when a cake tester or toothpick inserted near the center comes out clean. Let the cakes cool completely before removing them from round pans. Run a sharp knife along the sides and tap on the counter to loosen, then cover with a plate, flip over and remove the pan. Hull and slice the strawberries. Stir with lime juice and/or zest and sweetener and refrigerate until using. Empty the cans of coconut cream, including liquid, into a bowl or food processor container and whip with an electric mixer, stand mixer, large-capacity food processor, stick blender or by hand. When it changes from coconut solids to a soft cream, add sweetener and vanilla to taste. Keep beating or pulsing until the cream thickens enough to hold peaks, usually within a few minutes. Refrigerate until using. If the whipped cream hardens during storage, beat with a whisk until creamy. If you’re making a layered cake, assemble it close to serving time. For best results with a square cake, slice it first and top individual servings with berries and cream. To make it extra fancy, garnish with fresh strawberries, grated lime zest and/or toasted coconut. Toast the coconut over medium-low heat, stirring constantly, until it’s browned to your liking. Remove it from the pan as soon as it’s off the stove to avoid burning.